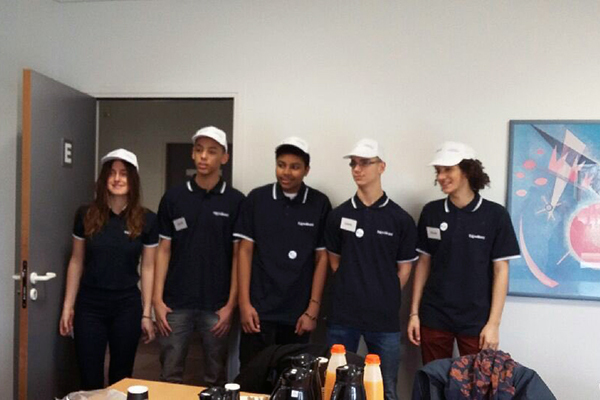 Congratulations to students from France who have been selected as one of the three best teams. 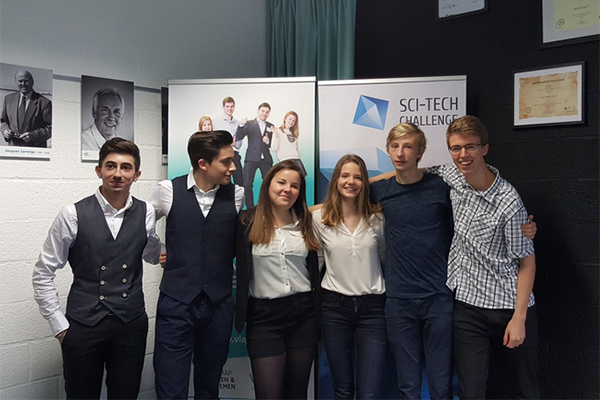 They will represent their country at the Sci-Tech European Grand Finale in Brussels on 10 May. “Our project is a totally new type of car, we called it the Norman Car. It consists in reducing the weight and improving the aerodynamics of our car. Thus, it will reduce gas emission and fuel consumption. Then we created a system which will be able to store and recycle the carbon dioxide. It's called the "Carbon Capture". The system will be located at the back of the Norman Car, we'll only release water and we'll store the carbon dioxide in a big pocket. The carbon dioxide will be used to farm algae. It will help them grow. Thanks to algae, we'll make a biofuel and we'll create a never-ending cycle”. “Working in the STEM field in the future is maybe one of my dreams. It will be the result of each year of my schooling, of my learning process. In my opinion, science, engineering, mathematics and technology are the future of the world. Without these subjects the world won't be improved, new technology won't be developed...I would like to work in a foreign country, like maybe the United Kingdom, The United States or Canada because I think that there are more opportunities than in France, because English is for me, the key to success”. What did you learn from the Sci-Tech experience? “From Sci-Tech, I learnt a lot of things. Firstly, a team spirit. With Sci-Tech, we worked in a group of 5 so we had to communicate a lot to express each interesting ideas, it was really interesting to do that, because if we didn't communicate, it was lost. Secondly I learnt new things from each different project. For example, I learnt how to use the carbon dioxide for photosynthesis, what a hybrid car was, so it was very enriching for my knowledge. To sum up, I learnt that science can be more interesting like our mobile phone or video games for example. Of course science was like a game during the project and it was fun that we didn't have real pressure, it was cool. Science, mathematics, technology and engineering were essentials to conclude our project, we really had to reflect a lot. It was a challenge”. What was your main challenge? How did you overcome it? “I think that our main challenge was time. Yes, because we only had 3 hours to think about our project and it was really short. To overcome it, we communicated a lot and we divided our work. One was working on the slide-show, the other one was writing the text, the last one was drawing our device etc. We worked in pairs, 2 people to make the slide-show, 2 people to draw and the last one to write the text. I think that it's the reason of our success. It was really difficult to finish our project in each point. It was very interesting, we had to be organised”. What will you be working on until the Grand Finale in Brussels? What will you be trying to improve? What excites you about the finale? “Until the Grand Finale in Brussels I’ll work about my Carbon Capture and especially the amino-acid liquid because I'm not sure about certain points so I have to improve this because my unique goal is to win this finale! Then I'll work hard on my pronunciation because I really have a French accent. I'll try to improve my grammar at the same time. The Challenge of the finale really excites me because like I said earlier I really want to win this, I'm a competitive student but before everything I want some amusements, some fun and I want to share this experience with my friends and teachers because all of this is thanks to them. Without them, it's sure that I wouldn't be here”. “I would recommend this experience to my friends because it can only have positive ways. There are no losers, the main thing is to participate, no one will judge you, you are here to explain your project and to defend your opinion, that's all. To conclude, you'll exchange with different countries and different high schools of your country and in my opinion it's the most interesting fact of the project”.